One of the great joys of working with two talented post-docs in the research group – Mike Stout and Mudassar Iqbal – as well as a great collaboration with Theodore Kypraios, is that they are often one step ahead of me and I am playing catch-up. Recently, Theo has discussed with them how to estimate the error variance associated with the data used in Metropolis-Hastings MCMC simulations. where is the error variance associated with the data. Now, when I first started using MCMC, I naively thought that we could use values for provided by our experimental collaborators, and so we could use different values of according to how confident our collaborators were in the measurements, equipment etc. What I found in practice was that these values rarely worked (in terms of convergence of the Markov chain) and we have had to make up error variances using trial and error. So I was delighted when I heard that Theo had briefed both Mike and Mudassar about a method for estimating the error variance as part of the MCMC. Since I have not tried it before, I thought I would give it a go. I am posting the theory and some of my simulations, which are helpful results. 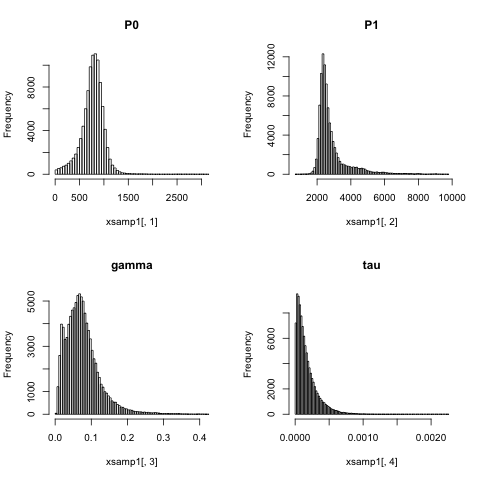 We observe that this is itself a Gamma distribution, with parameters and . Thus the parameter can be sampled with a Gibbs step as part of the MCMC simulation (usually using Metropolis-Hastings steps for the other parameters). The aim is to use a Metropolis-Hastings MCMC, together with a Gibbs step for the parameter, to fit the data. The issue that immediately arises is how to set the parameters and . This may seem arbitrary, but it is already better than choosing a value for , as the Gamma distribution will exploring of that parameter. For my first simulation, I thought that would be sensible (this turned out to be a remarkably good choice, as we will see). So I set and and lo and behold, the whole MCMC worked beautifully. (Incidentally, I used independent Gaussian proposals for the other three parameters, with standard deviations of 100 for the and and standard deviation of 0.01 for . These parameters were forced to be positive – Darren Wilkinson has an excellent post on doing that correctly. Use of log-normal proposals in this case leads to very poor mixing, with the chain taking some large excursions for the and parameters). The median parameter values are , , and . The latter corresponds to . 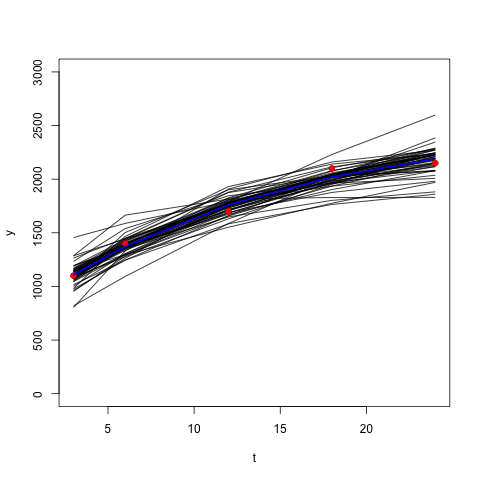 With these values, we can see a good fit to the data: below are plotted the data points (in red), the best fit (with median parameter values) in blue, and model predictions from a random sample of 50 parameter sets from the posterior distribution in black. As you can see (please ignore the last line for now), the results are robust to a very wide range of and , even producing a good estimate for when that estimate is a long way from the mean of the prior distribution. But then we can make the following observation. Consider the sum of squares for a ‘best-fit’ model, for example using the parameters for the first row (this is 12748). So as long as and , the prior will introduce very little bias. But if you try to use values of and especially very much larger than an estimated sum of squares from well-fitted model parameters, then things might go wrong. For example, when I set and then my MCMC did not converge properly. The algorithm should work perfectly well sampling from this Gamma distribution, and indeed it does, producing comparable results to when an informative prior is used. It is simple to implement and fairly fast to run – adding a Gibbs step is no big deal. It is clearly preferable to making up a fixed number for the error variance – which was what we were doing before. The prior parameters allow you to make use of information you might have from experimental collaborators on likely errors in the data. The level of bias from the priors is relatively low, and can be eliminated altogether.